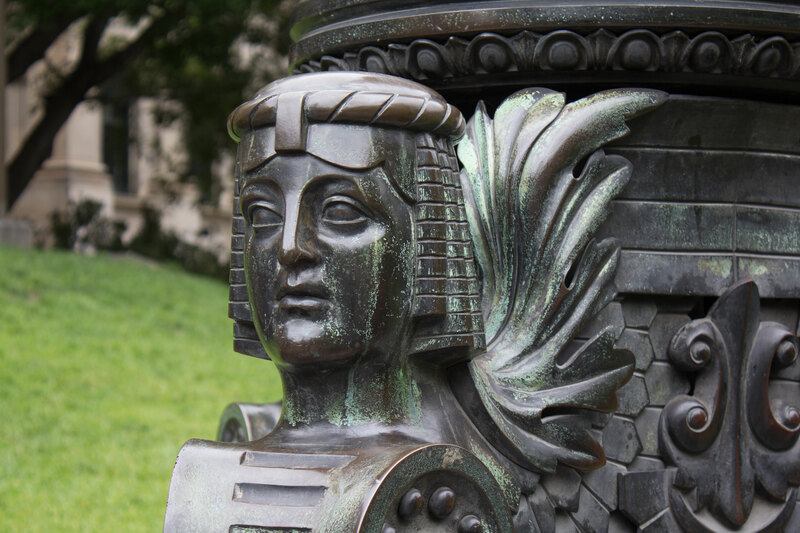 At a time when the entire façade of the Library can be bathed in coloured light or submerged beneath digital projections, the humble lamp posts on either side of Redmond Barry’s statue might tend to be overlooked, but they are hardy survivors. 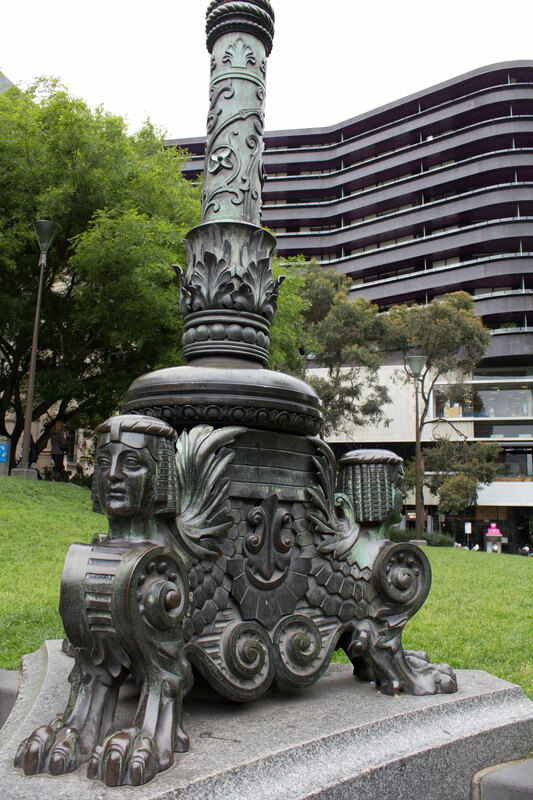 Created in 1891 they are the work of F. C. W. Richard, an ornamental metal worker whose workshop was in Howard Street, North Melbourne. The posts originally held three gas lamps each (shown below in 1901, wrapped in black mourning for Queen Victoria), but were converted soon after to a single electric lamp. F. C. W. Richard was born in Prussia, but became a naturalized British citizen in 1870. Migrating to Australia he at one point had workshops in both Melbourne and Sydney and exhibited a pair of wrought iron gates at the Centennial International Exhibition in Melbourne in 1888, which were highly praised. We have his photograph among the identity photos which were made of all the exhibitors at the 1888 Exhibition, surely one of the earliest examples of a photo ID. He was also responsible for the gas lamps and brasswork in St. Paul’s cathedral, completed in 1891. 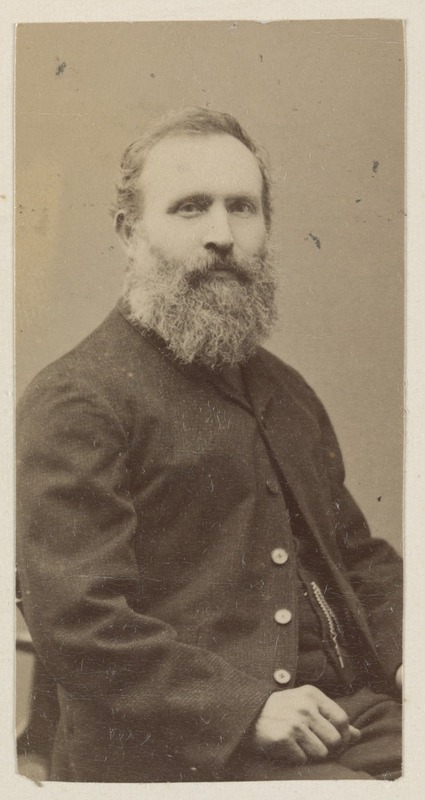 Perhaps affected by the economic slump of the 1890s, Richard put his Melbourne workshop and its contents up for sale in December 1894 and announced his intention of leaving the colony. Something must have intervened however, as the sale appears not to have gone ahead and he continued trading from the Howard Street address until 1901. He died in Marrickville, New South Wales, in 1917 at the age of 83. 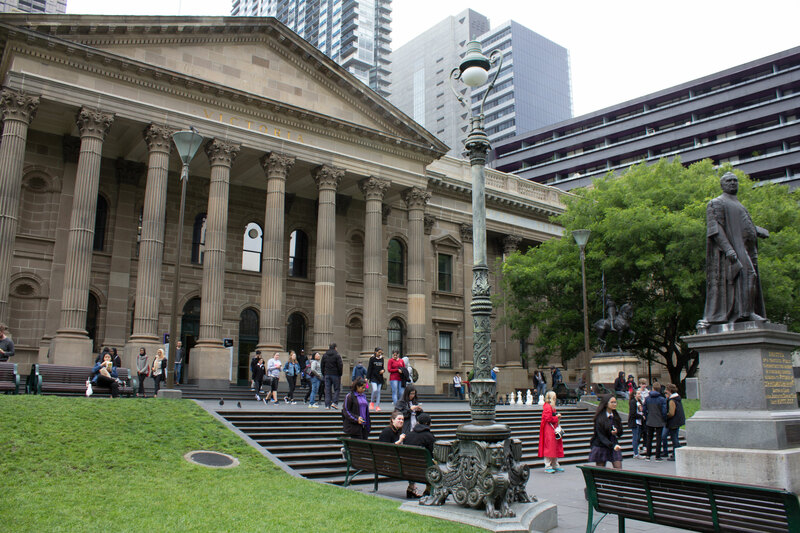 The Library’s Conservation team are currently treating the lamp posts, which at 124 years must be amongst Melbourne’s oldest working street fixtures. Very intersting and well researched. thank you. and make me aware off the all the things I miss on my walks around this young and beautiful City,State Country. Thanks for this information, I will take some time appreciate the lamp next time I’m at the library! This remarkable celebration of old sculpture reminds me that, as I recall, there used to be two statues of famous Melbourne men. But I no longer remember which are the two statues, or who the men were, or where either of the statues is now placed. More items please about the “overlooked” gems of Melbourne History. Do you have images of what I remember on the first floor – the cabinets with the mechanical engine examples that showed their action by the pressing of a button on the outside of the display case. Or even the “Sound Tester” – also on first floor. Or the Egyptology Display – which was “hidden away” in the rear building. Ah such happy memories of my youth – spent here. Really fascinating, I am empassioned by lamps and thrilled to hear of such historical and absorbing info and the maker. What Intricate work and detail by this wonderful craftsman F.C.W.Richards I just love it .It would be interesting to know how long it took him to create. !!! Thank you so much for telling the history of it . Will look at it with different eyes now when I visit.State Library. Delightful story. Would the State Library consider reproducing these figures as Book Ends for purchase in the Library’s shop, please? They would certainly be a welcome addition to many homes and continue keeping Melbourne’s proud history alive for many more years. Thanks for that lovely story. Will definitely take a closer look at this gorgeous lamp post on my next visit to Melbourne. 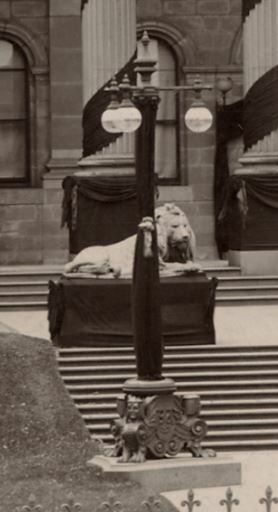 Also, does the lion statue (in the early photograph) still exist? Unfortunately the lions (there were two) were not as robust as they looked. They were cast in zinc and weathered badly, so that they were finally removed in January 1925. The author Marcus Clarke, who worked at the Library in the 1870s, used to put the remains of his after-lunch cigar in the mouth of one of the lions, as a sign to passing friends that he was in residence and available to visitors. lovely story about the mourning for Queen Victoria – what happened to the lion in the background? Jenni, there’s an answer to your question on an earlier comment, so look above. Another thing about the lions: when they became cracked and dilapidated, apparently the students at the Gallery Art School used them as letter drops for their love-notes. You might like to read about him in my book Victoria’s Iron Lacework (copy in State Library). If you contact me, I can tell you about more that he made. Thank you Robin, I’ve just seen your comment. I would be very interested to know more, haven’t managed to get to state library to borrow your book. Thank you great article. What happened to the lions? Linda, if you look further up the comment thread, you’ll see a quick answer to that question. Thanks for your hard work, Gerard. I’m sure it’s as fascinating to research as it is to read. I love these lamp posts.